NileCAM30 is a first GMSL camera in the NileCAM camera series. NileCAM30 is a two board solution containing the camera module and serializer board. This camera is based on AR0330 CMOS image sensor from ON Semiconductor®. The NileCAM30 comes with 3 meters or 15 meters coaxial cable with FAKRA connector. The NileCAM30 has an S-mount (M12) lens holder which allows customers to choose and use the lens according to their application requirement. Customers who own platforms that support USB 3.1 Gen 1 interface and are interested in evaluating the 3.4 MP GMSL camera module, can directly buy the NileCAM30_USB from e-con Systems. 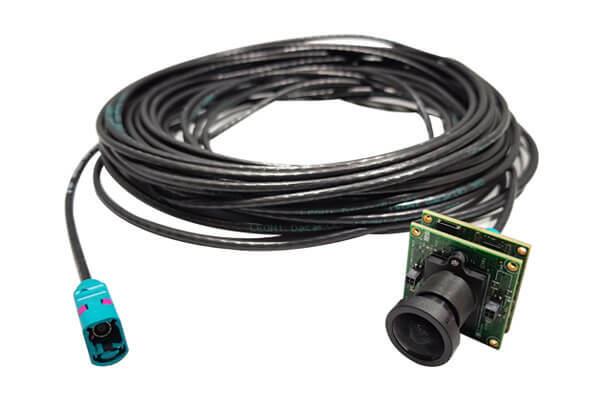 Customers who own NVIDIA Jetson TX2 and are interested in utilaizing the MIPI interface to evaluate NileCAM30 - 3.4MP GMSL Camera module , can directly purchase the NileCAM30_TX2 from e-con Systems. Customers can also purchase it with 15 meter cable or 3 meter cable. e-con Systems provides camera driver development, customization and porting services for NileCAM30 on any application platform as per customer requirements. For any driver customization or porting services or for using this 3.4 MP GMSL camera with your application processor platform, please contact sales@e-consystems.com along with your requirements details.